Two passenger jets carrying more than 300 citizens from Russia, Belarus and other countries have landed safely near Moscow following several days of delays, as the foreign nationals tried to leave conflict-torn Yemen. The two planes landed within hours of each other at the Chkalovsky airfield in the Moscow Region early on Friday morning. The first aircraft was carrying more than 160 people. Apart from 120 Russians, passengers included Belarusians, Poles, Ukrainians, Kyrgyz and Uzbeks. There were 79 children and teenagers on board. The second Russian aircraft, with 150 people including Russians, Belarusians, Poles and others, landed hours later. “We’re relieved that all of our fears are behind us. We couldn’t leave for 48 hours,” one female evacuee told RT. “Sanaa is extremely dangerous right now. Everyday there’s shooting, explosions,” she said shortly after landing. The two planes had been sent to Sanaa on Wednesday, but were held up when the Saudi-led coalition, currently conducting airstrikes on Yemen, withheld permission to land. The aircraft spent the night in Cairo before landing in Sanaa on Thursday. On Thursday, a Chinese naval frigate evacuated over 200 foreign nationals from Aden in southern Yemen. Clashes are raging there between Houthis, those loyal to Yemeni President Rabbuh Mansur Hadi and other factions including Al-Qaeda. After a night of fighting, Houthi forces withdrew on Friday from a central Aden district they had seized a day earlier. Earlier this week the UN evacuated its personnel from Yemen as the violence in the country rapidly escalated. Various countries, including Germany, the US, Turkey and Japan have closed their embassies in recent weeks. 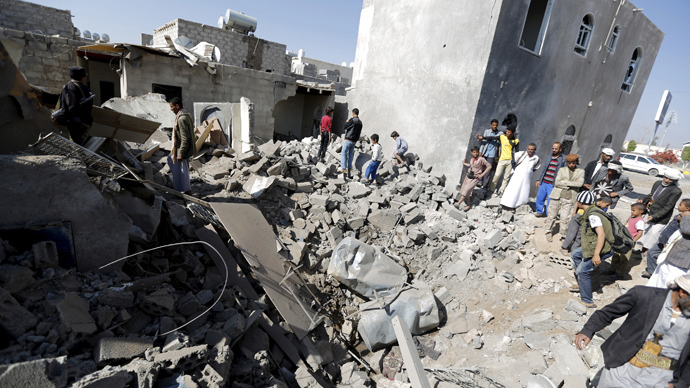 Last week, Saudi Arabia and a coalition of regional allies began launching airstrikes on rebel positions throughout Yemen. In recent months, Houthi rebels, a militant Shiite group, have gained control of many parts of the country, including Sanaa, the capital city. President Hadi fled the country last week after being ousted by rebels in February. Houthi leaders have described the Saudi-led intervention as a declaration of war. According to UN aid chief Valerie Amos, some 520 people have been killed in the last two weeks of fighting in Yemen.